What do you get for the Chicagoan (or Chicago lover) who has everything? There are certainly a lot of options, but it can be overwhelming to sift through them yourself. To help make holiday gift giving a little bit easier, here is a list of the top 10 list of unique Chicago gifts. For bonus points - everything is made or sold at local shops in Chicago! Chicagoans are obsessed with the El, in that they love to complain about it, yet are still wearing to adorn themselves and their homes with CTA-branded merchandise. Transit Tees is a funky company that works in tandem with the CTA to satisfy the demand for creative Chicago merchandise. 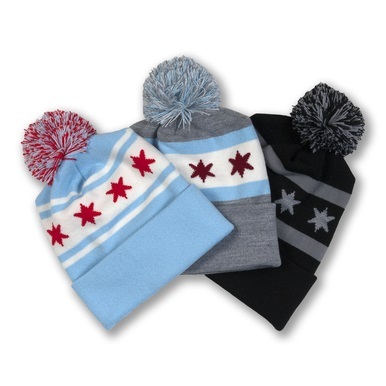 This Chicago Flag beanie with a pom is the perfect gift for the cold winter. Foursided is a unique stationary and Chicago gift store that may just satisfy all your unique Chicago gifts needs. One of the most popular items they sell is this dainty Chicago necklace - perfect for the Chicago girl in your life! You could probably get Cub’s World Series merchandise just about anywhere at this point, but why not reward the merchants who’ve stuck behind them through thick and thin? Wrigleyville Sports has a grand selection of Cub’s merchandise for anyone on your list. Warm weather gear, like this hoodie, will be much appreciated come December! Everyone in your family should be able to show their Chicago pride, which is why this Chicago flag dog collar is the perfect gift for someone with a pooch! Six Point Pet has plenty of sizes to choose from. If you’re a local, you might roll your eyes. But it’s hard to deny a bowl of Garrett Popcorn Chicago mix (cheese and caramel) if it’s right in front of you. This unique Chicago gift would be excellent served at a holiday party, or gifted to a loved one! The creator of Mario Maps is a Chicago local, and creates video game style (specifically Zelda and Mario) neighborhood maps for big cities across the US. Fortunately, Chicago is well represented. This would make a great gift for a Chicago resident/retro video gaming nerd. There are many fabulous books by talented Chicago authors about this great city. Mysterious Chicago is a newly published book that dives deep into Chicago’s unsolved mysterious, with a journey guided by author Adam Selzer. There are plenty of museums to choose from, but a crowd favorite has to be the Art Institute of Chicago. With so many rotating exhibits and events, you probably couldn’t see everything in even a year’s time! Vosges Haut-Chocolat's are a little taste of heaven, with the price tag to match. These luxury chocolate creations are made in Chicago, and are a favorite of locals. They’d make a lovely stocking stuffer or corporate gift! Fledgeling furniture company Frenchy Furniture makes some incredible Chicago-focused pieces with reclaimed wood and galvanized steel details. Get in contact with them for custom pieces and pricing! Will you be purchasing anything off this top 10 list of unique Chicago gifts? Or is there anything you’d add to the list? We’d love to hear from you!